FANBOY PLANET.com . : mc-markryan :. "Would you like to interview Mark Ryan, the voice of Bumblebee?" came the p.r. request in my inbox. I'd just seen Transformers, and knew something of the plot. 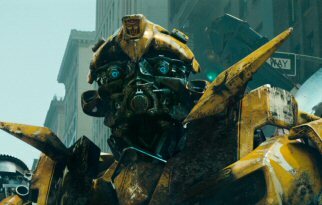 One of the running gags had been that Bumblebee speaks through songs on the radio, only developing a voice of his own late in the film. My first instinct was to blow it off, then, but I'm glad I changed my mind. It turns out that Mark had actually done most of the voices for the robots on the set, so the live-action actors had something to respond to, and had been present for and involved in several phases of the Transformers production. Looking into Mark Ryan's biography, I found an interesting guy whose career has touched many areas I love. He's an official swordmaster, brilliant at stage combat and fight choreography. He'd been a regular on the BBC's Robin of Sherwood. Heck, he spent a year touring with Eric Idle reliving the best of Monty Python. Turns out he's even written comics for DC. How could I not want to talk to this guy? So here goes. The result is an interesting look behind-the-scenes at one of the summer's hottest films ...and more. Derek McCaw: How did you get involved in the Transformers film in the first place? 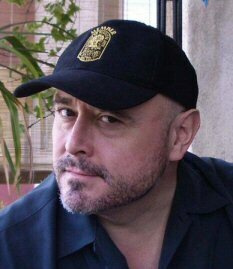 Mark Ryan: I was called in by Casting Director Michelle Lewitt who'd spoken with my agent Brian McCabe about a mysterious new project looking for a British actor with theater experience. Michelle faxed over several sides of dialogue and I was sworn to secrecy. She advised me not to learn the material as it probably wouldn't end up in the final cut of the project, but be prepared to read several parts at the same time! It was a very relaxed meeting as I'd worked for Michelle previously and she ended up videoing me doing several parts from the scenes I'd been given. I really didn't know much about the project and drew character voices from my own childhood favorites and threw in a few other voices just for fun. I'm not even sure if I was fully aware of the scale of the production or who was involved in it at that point. Derek McCaw: You did what I guess we'd call "scratch" vocals for several of the robots while filming took place. What did you do to finally convince Michael Bay that you should be Bumblebee? Mark Ryan: Bumblebee didn't talk in the version of the script I was working from on the set. I'd voiced the scene when the Autobots discussed how he'd lost his voice, so at that point it was a done deal. Later in the post production phase, Michael would often throw in new dialogue ideas, especially humorous lines and just say: “Try it like this or just say that!” We did a lot of that and we were just like two kids having fun with the characters. During one of these many sessions Michael gave me some new dialogue that I'd never read before and we just played around with it. We tried several character voices at different pitches. I wasn't sure how it would be used but obviously I knew by then the Bumblebee back-story. That set me free to voice it with an understanding of the emotional weight of the character and the dramatic effect it might have at that moment in the story. I gave it my best shot but it was just one of many lines recorded during those sessions to be used for dubbing and editing. I'd genuinely enjoyed being involved with the project and I'd had fun working with Michael and the whole team but given the transient nature of the business and the size and complexity of the project, I quietly decided to get on with my life and promptly forgot all about it! Derek McCaw: How was it working with Bay? Mark Ryan: The man's a creative genius! He's very focused on the set. He's very energetic and pushes hard but he understands every single element of a large-scale movie production unit and the nuts and bolts of how to get it in the can. It requires skill, drive, expertise and nerve to pull it off successfully on this scale...And Mister Bay has shed-loads of all those elements. I've been on many large-scale sets and you better believe that when there's $150 million on the line you need to keep moving and shoot efficiently and plan every last detail of any big sequence. Let alone the scale of action there is in Transformers. It's a massive achievement. Michael's crew and stunt team is a first class operation and a well-oiled machine that pushes the envelope and goes all out. He knows this and he's very loyal to them. It does take a little time to tune into what any director is seeing in his head. Michael was very open and showed us the animatics, rough computer renderings of the scenes so we could see how it would look and what he was shooting for. "Hey! No leaking in the pool!" Very early on, during the scene outside Sam's house, I remember looking at the monitor at Prime's POV as seen from the “Russian Arm” camera and thinking: “This is going to be a very funny scene!” Just the concept of giant alien robots trying to hide and be inconspicuous in the back garden of a suburban house was visually very funny. In the postproduction phase and edit suite he was very relaxed and just having fun with the dialogue and the characters. I knew most of my material would either end up on the cutting room floor or would be voiced by someone else, so it was easy to relax and just play with ideas and the humorous elements. Derek McCaw: As a "voice," how much interaction did you have with the cast? Mark Ryan: I guess I worked with Shia the most. The guy is simply brilliant, very talented and very grounded. We ran lines together with Megan before scenes as dialogue changed even on the set. I was there just to help them get the best out of their dialogue with the robots by bouncing the drama off another presence. You have to tune into the rhythm and pace of the delivery and place the robot's lines accordingly, trying not to screw up the actor's performance or step on their dialogue! The camera's on them and they're the money! No pressure, right? But I don't think that Shia ever said the same line, the same way twice! This really brought the dialogue to life though, and made it very spontaneous. I just had to be on my toes. I also really enjoyed feeding the lines to John Turturro who ad-libbed a lot of funny stuff during the first encounter with the Autobots. He's a real pro and I've admired his acting style ever since To Live And Die In LA. I told him so. It was a real treat working with him. Other than that, my constant companions were five, very long, alloy poles with red lights on the end. Sometimes I could even tell which one was which Autobot! I did also spend quite some time with ILM's Visual Effects genius Scott Farrar and onset sound maestro Pete Devlin. 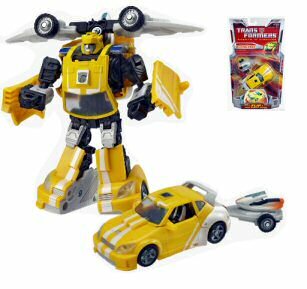 Derek McCaw: How would you have approached Bumblebee differently if he'd still been a VW Bug and not a Camaro? I probably wouldn't. Don't forget he didn't speak in the beginning, so I actually didn't think much about it. 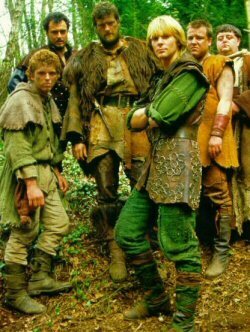 I was already filming Robin Of Sherwood when Transformers first aired in the UK so I had no set preconceptions about the Autobots characters or vehicles. When I got the onset job I obviously went away and did my research but I worked mainly from the material I already had and the basic characterizations that were established. The vehicles weren't set in stone in my head though, which I think was an advantage. Derek McCaw: You've worked as a swordmaster, so was your expertise used for any of the fight scenes? Mark Ryan: Kenny Baits' amazing stunt crew were already hard at work by the time I joined the production but I knew Garret Warren and we did talk about styles and various types of weapons the robots could use. Garret's a great bloke and he did an amazing job. He knew I'd faced the same challenge on King Arthur of coming up with a lot of varied styles and types of fighting imagery for a large cast of main characters. I'm always aware of stepping on people's toes though, so we simply chatted over coffee and I threw out a couple of ideas. The whole stunt crew did an amazing job and I hope they get recognized at next years stunt awards. Derek McCaw: Give me a scenario where you could choreograph a fight - which two Transformers would make the best swordsmen? Mark Ryan: Optimus already has an “energy sword,” so a bladed duel between Megs and Prime would visually be a magnificent dramatic fight scene. Derek McCaw: You spent some time touring with Eric Idle on his Monty Python "revival" tour - which was your favorite role in that? I'm very proud to be able to say that I'm one of only two men (the other being Peter Crabbe) who can ever claim to have walked on those hallowed boards wearing a green sparkly frock! Eric demanded he should be able to wear the only red one! It's a treasured memory. Derek McCaw: You've been up late, it's been a while since anyone had dinner, everyone's pushed to the limit - who's crankier, Eric Idle or Michael Bay? Mark Ryan: Actually neither! Both gentlemen are smart enough and keenly aware that the most vital element in keeping your team or crew happy (and therefore be able to drive then harder for longer without a revolution on your hands) is a full tummy! I have to say Michael's craft services are first class and dished up some of the best grub I've ever tasted on a set. Set caterers really are unsung heroes and work very, very long hours. But it's vital to crew morale! Just ask any director! Good and plentiful craft services are a wise and prudent investment! Okay, not exactly Green Arrow, but it's got green, it's got arrows, and it's got Mark Ryan in the picture, back and to the left. for DC. What did you do, and what attracted you to comics? Mark Ryan: Some years ago I wrote the 50th Anniversary Graphic Novel Edition of Green Arrow with Mike Grell. It was great fun and Mike's an amazing artist. We've wanted to do something together ever since and we actually have a new graphic novel project we'll be announcing at Comic Con in San Diego next month. It's called “The Pilgrim” and I've been developing it for a long time. Mike's always wanted to do it, so we finally get to work together again! Derek McCaw: Assuming there's a Transformers 2 (note: green-lit on Monday), what are your hopes for Bumblebee? Mark Ryan: I really enjoyed the characterization of BB in this production very much. I think the writers did a great job of making him human and humorous and yet a stoical soldier with a sense of duty and self-sacrifice. It would be great to explore the history that made BB what he is and further develop the friendship and bond with Sam as the Autobots adapt and overcome the challenges they will face on their new home. Mark also voices more Transformers in the video game. I look forward to catching up with him at Comic-Con.